In 1968, the Tacoma Opera opened their doors for its first production of Die Fledermaus on the Pacific Lutheran campus, and now they are ringing in their 50th season. The Tacoma Opera offers both traditional and non-traditional productions while in an intimate setting where audience members can experience the opera in a unique way. Over the past five decades, the Tacoma Opera has grown from a small amateur company into a professional establishment, attracting attention throughout the nation. The Tacoma Opera embraces their audience members, encouraging them to dress up to paint the town red, or in jeans and a t-shirt, whatever it takes to help to make the evening special. For its 50th anniversary, they are performing two operas and one operetta. 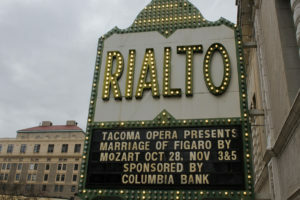 In the fall, they opened with The Marriage of Figaro by Wolfgang Amadeus Mozart in the Rialto. The theater will perform Carmen by Georges Bizet at the Pantages in February for their 50th anniversary production. They will then close out the season with the operetta The Merry Widow by Franz Lehar, at the Rialto. It’s not too late to attend a show from this special 50th anniversary season! Details for the 2017-2018 season are now available, and tickets can be purchased through the Broadway Center Box Office at 253-591-5894. More info at tacomaopera.com.